A group of business leaders, property owners, government officials, and citizens in Royal Oak has formed the Take Back Royal Oak (TBRO) coalition of taxpayers in response to a development rift with the city. Royal Oak proposes to build a new city center and has selected Lansing’s Boji Group and several partners to complete the project without a public bid, TBRO reports. The city also plans to give Boji $5.5 million in cash to help the developer obtain a construction loan, while selling the so-called Williams Lot next to city hall, which has an estimated value of more than $2 million, to Boji for $1. Royal Oak officials on Tuesday broke ground on the Central Business District development, which includes a proposed office building. An earlier plan by Boji offered more features, but now the office building was reduced to 138,000 square feet from 190,000 square feet, and the city would be responsible for building a new city hall and constructing a parking deck, a new police station, and a park. In addition to the coalition’s opposition to the financial arrangements of the project, it has concerns regarding a lack of handicap parking to the district and the city’s debt (on Tuesday, as part of the groundbreaking, the city fenced off the Williams lot, an area just east of Main Street that closed off dozens of parking spaces). The city is also fighting two lawsuits filed by Royal Oak taxpayers for exceeding the city charter’s debt limits. The coalition’s complaints against the new Central Business District development also include a lack of transparency and a lack of formal traffic and parking studies. It is also concerned about the development’s impact on the Farmer’s Market and says site plan development did not take into consideration input from adjacent properties and business owners. “First, our elected officials authorized over $126 million of debt to buy stocks in 2017, assuring us that the city is smart enough to earn enough money in the stock market to pay off that debt as well as the city’s gigantic unfunded retiree obligation. This debt was so substantial that it caused the city to exceed its debt limits in our city charter – a limit established to protect taxpayers and our city’s financial well-being,” says LeVasseur. An April 18, 2018 report by S&P Global Ratings on the City of Royal Oak affirms that, “The city’s total debt burden is high.” The two taxpayer-initiated lawsuits are seeking a court order compelling the mayor and commission majority to obey their oaths of office and comply with City Charter debt limits. Commissioner LeVasseur agrees that the City is acting recklessly with taxpayer dollars and is in violation of the City Charter. Should the city be sued by bond holders, he says residents may be looking at an unfunded $60 million tax bill along with interest. 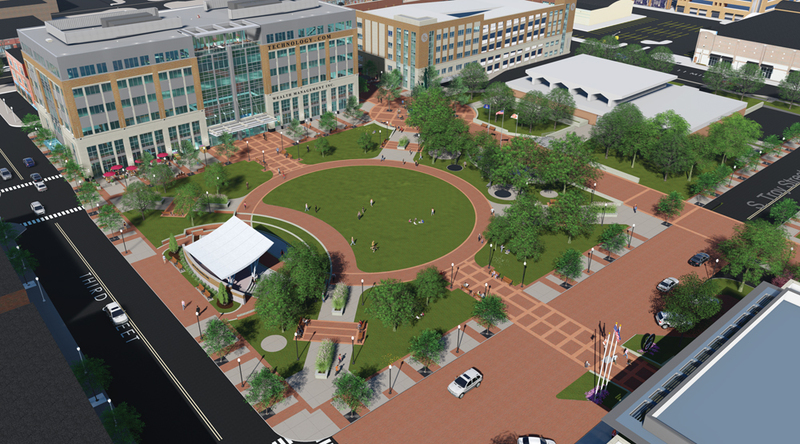 Royal Oak officials declined to say why the project wasn’t put out for a public bid. In turn, the coalition reports that Boji and his affiliates provided campaign donations to Royal Oak’s mayor and select commissioners in the runup to the most recent election last November. The coalition also reports that persons with physical disabilities, and seniors wishing to work for, or frequent, businesses and restaurants along Main Street, must now navigate two-to-four blocks due to the closure of the Williams lot. The only downtown handicap parking is in city lots and structures – no street parking is available for people with disabilities. In addition, the collation says Boji and the city’s development proposal has resulted in Andiamo’s, Cantina Diablo, Red Fox, and other organizations deciding to not renew leases or sell their businesses. DBusiness magazine ran a story in its November/December 2017 issue that explores Royal Oak’s plans to build the new city center and its involvement with Boji Development.